Ooooo it’s been a busy summer. 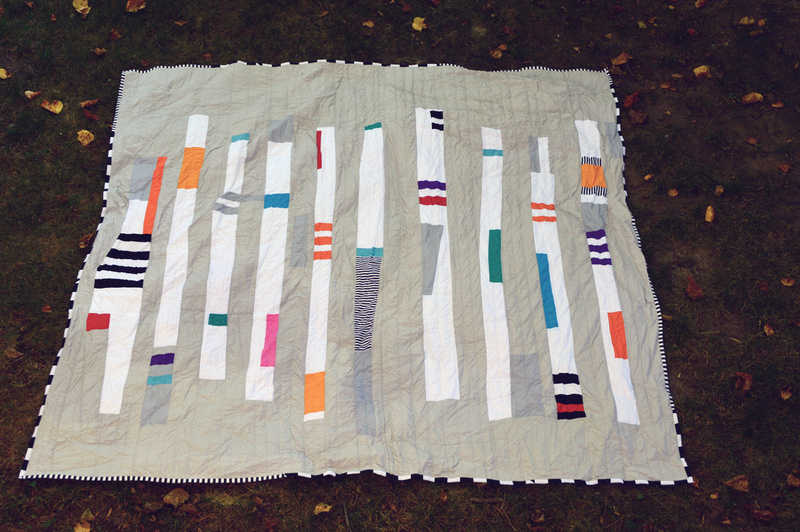 I made this quilt a while ago and have been meaning to blog about it forever. 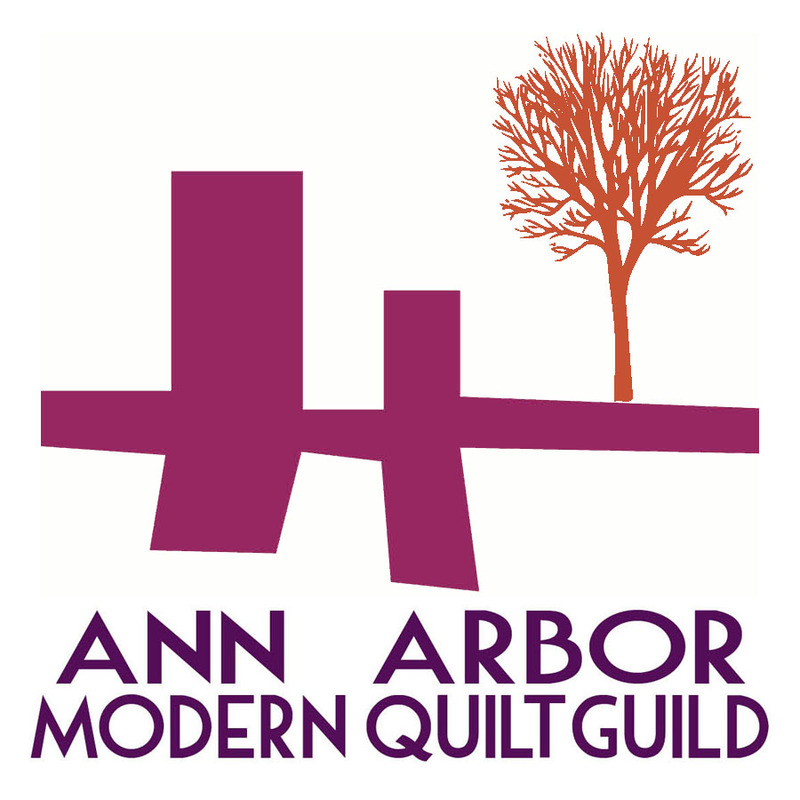 But then this morning I got some great news – Folded Flock is going to be in the International Quilt Show’s Modern Quilt Guild showcase in Houston! 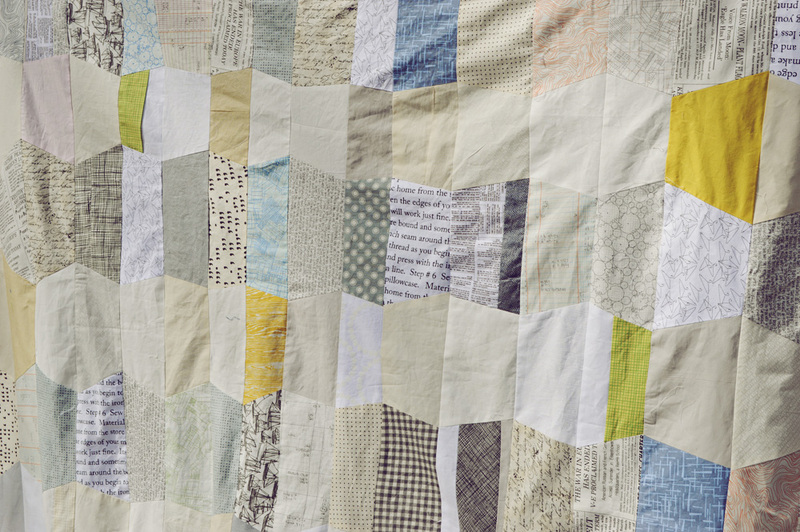 This quilt features the Botanics line by Carolyn Friedlander. The quilting was done on my walking foot. One large arrow shape echoed many times. 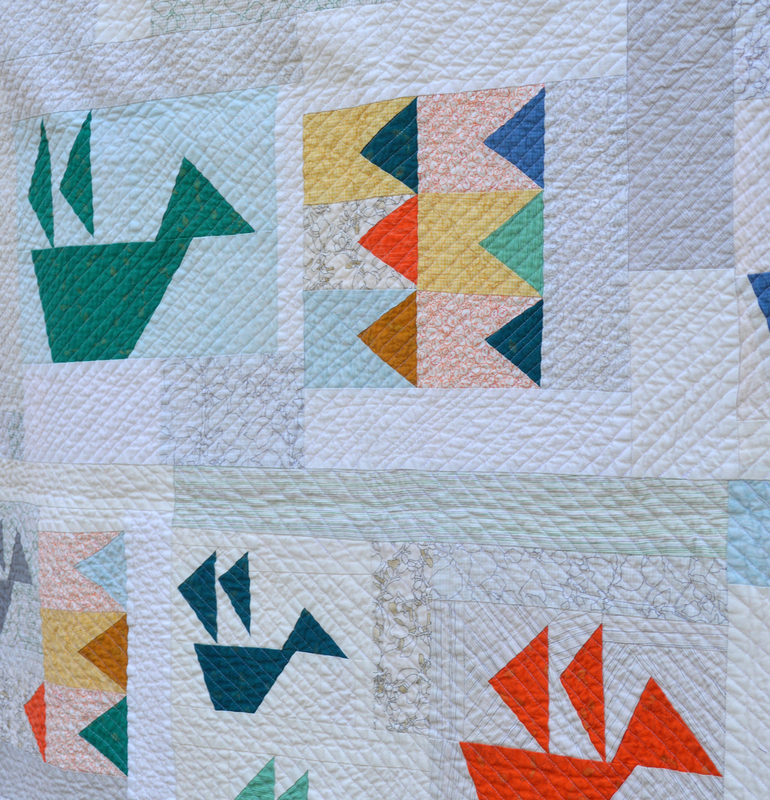 This quilt was inspired by origami cranes and this rug designed by Lesley Barnes. I sketched out my idea on the computer. 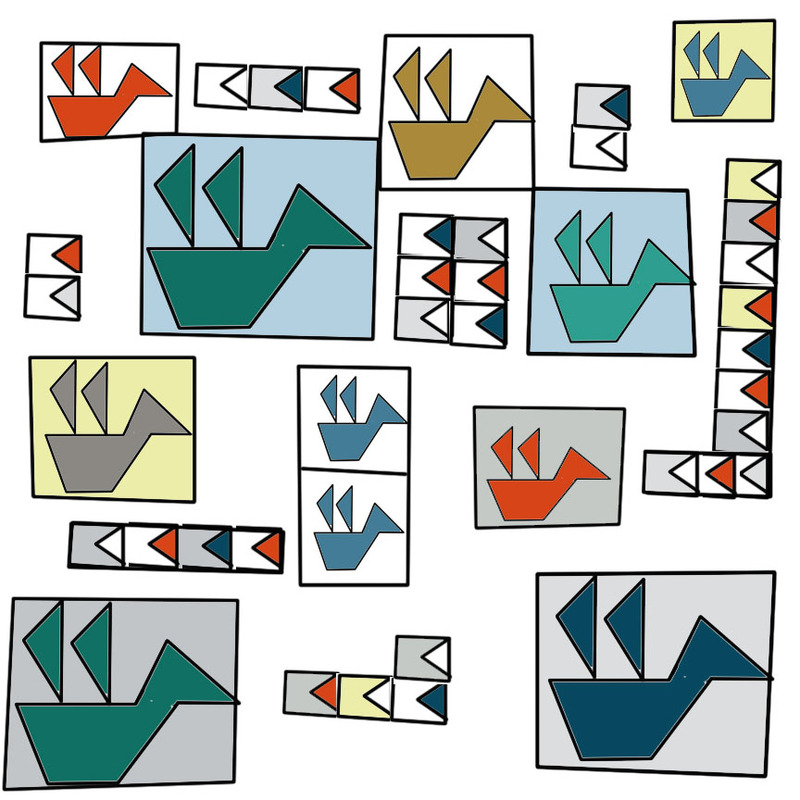 Birds and arrows. 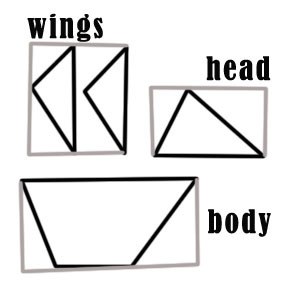 I made the wings, head, body for my birds and used extra background fabric to flesh them out into rectangular blocks. 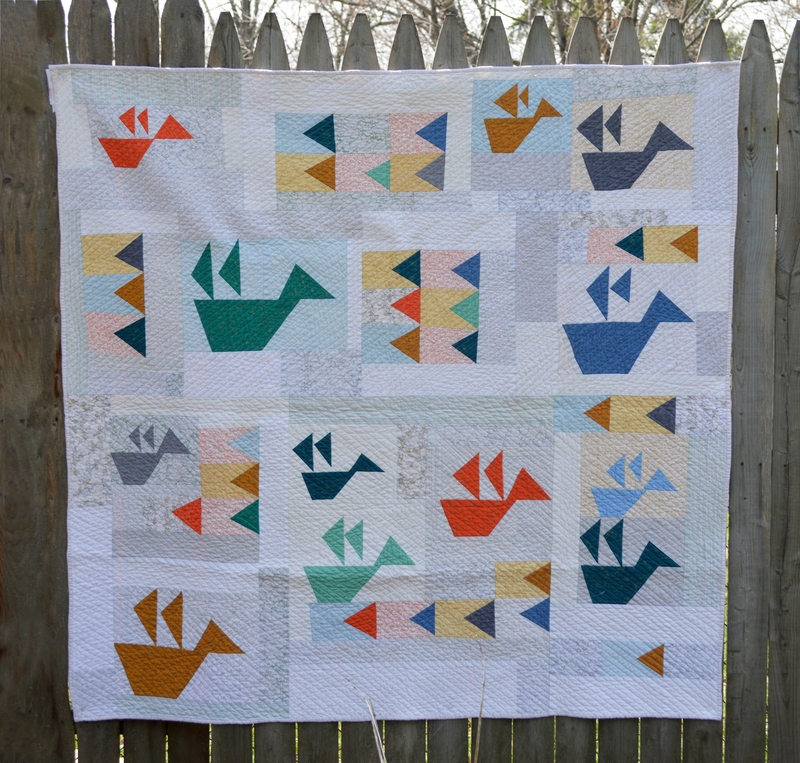 I’ve made another post – here – describing more about how I slabbed together fabric to make my bird and arrow blocks! Thanks for stopping by! 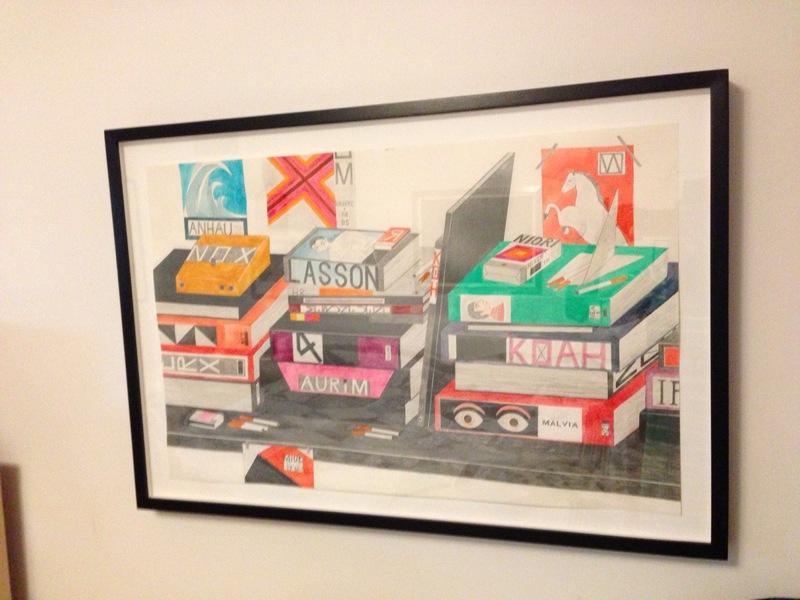 My sister in law recently acquired a piece by YURI MASNYJ and decided she wants to hang it in her bedroom – where she will be sure to see it everyday. Each row was developed and built out, then framed with grey. 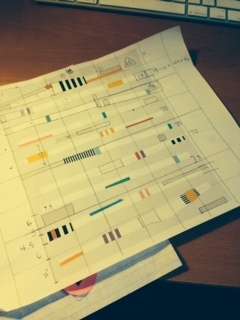 The rows were then joined and the final border was fleshed out until I had my desired width. 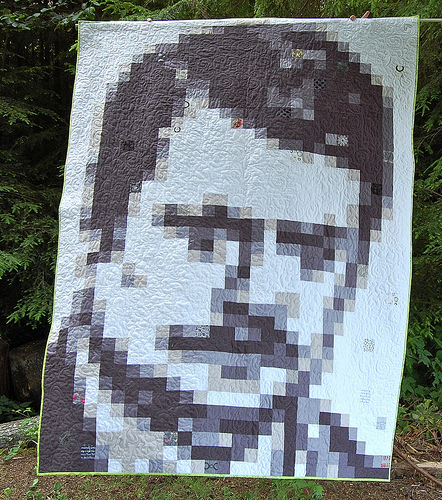 My Bernina people said that they would never try to quilt a King on their machine. 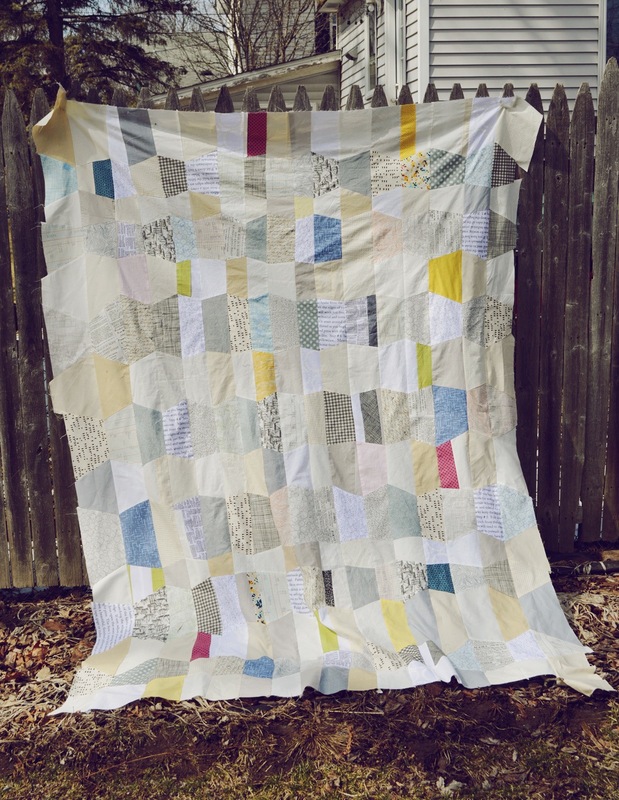 I have a 550 QE and I just didn’t want to give up and send it to a quilter without giving it a try – especially since I knew I really wanted a version of straight line quilting! I used a thin cotton batting and am happy to report that with my walking foot and ziggy zaggy stitch 16, as well as a large table with chairs around helping support the blanket, AND some clean gardening gloves to aid in my guiding of the fabric, I really had ZERO problems quilting this blanket. Zig Zag stitches every 1.5 – 3.5 inches throughout the entire blanket. I did it in two sittings. 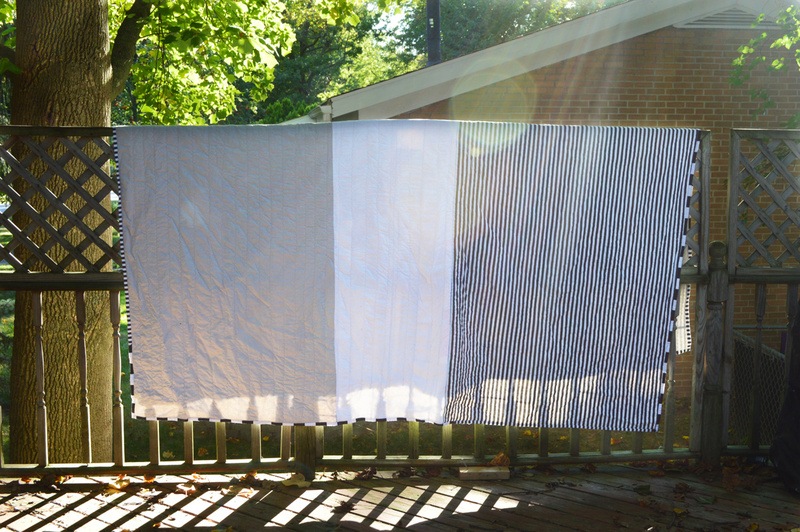 The backing is three panels: stripes, white and grey. The binding is stripe fabric (an homage to Red Pepper Quilts): some skinny stripes, some wider. 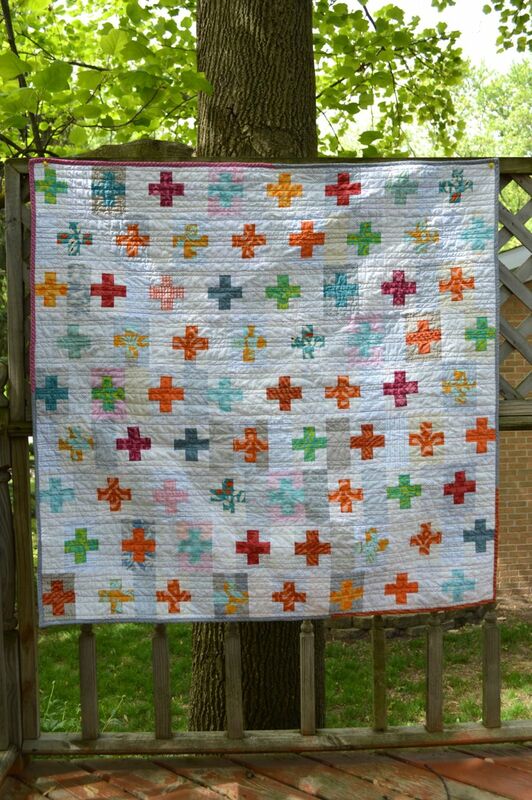 I am looking forward to making this quilt a little sister someday! I’d love to play with this design again on a smaller scale. A friend-of-the-family is having a baby! The couple are both very mathematically inclined, modern, and cool. They are expecting a baby girl, but aren’t interested in over-the-top-girly-goo-goo-gaa-gaa things. 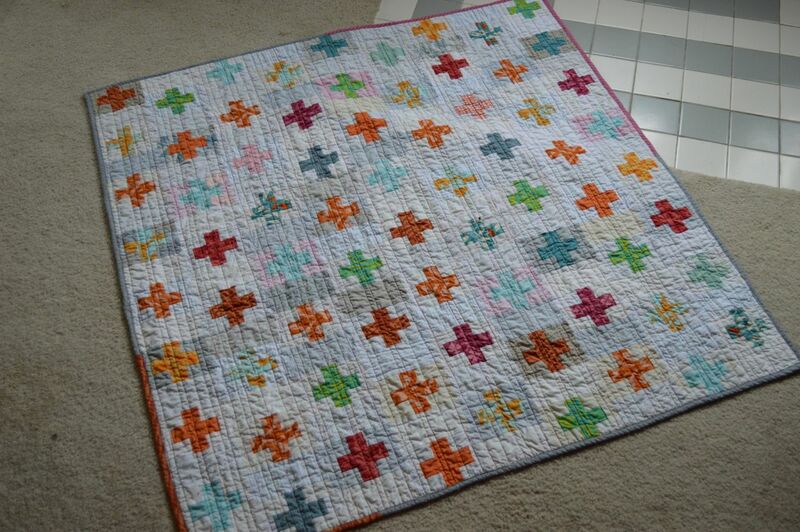 After seeing Debbie’s quilt and this one from Film in the Fridge, I decided to make this plus block blanket. 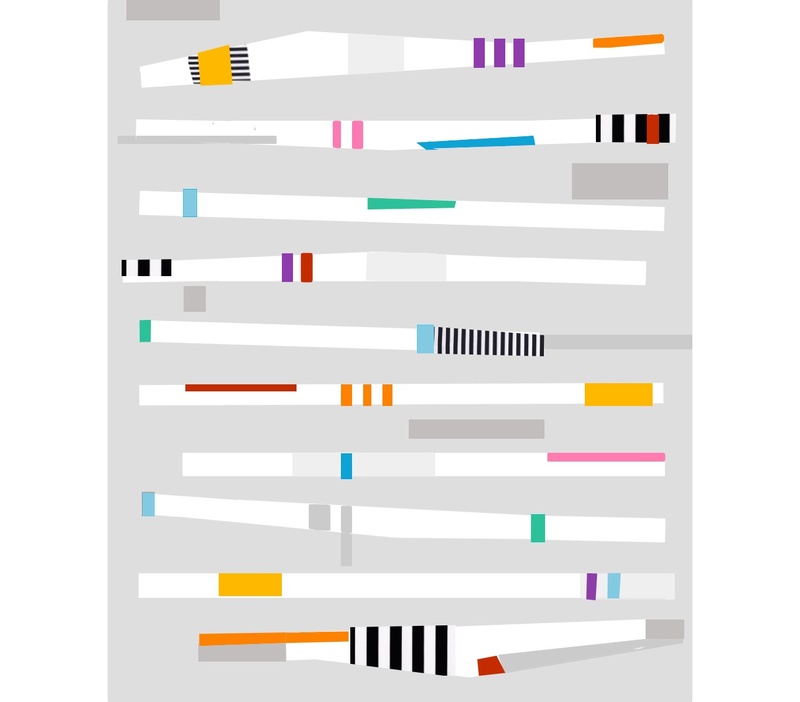 Assorted greys, whites, and a bit of pink work for the background, and the pluses are primarily orange, teal, blue, or pink. I really love how this turned out! And for the back? My mother-in-law asked if I’d be able to find Pi symbol fabric for these engineers. Of course! 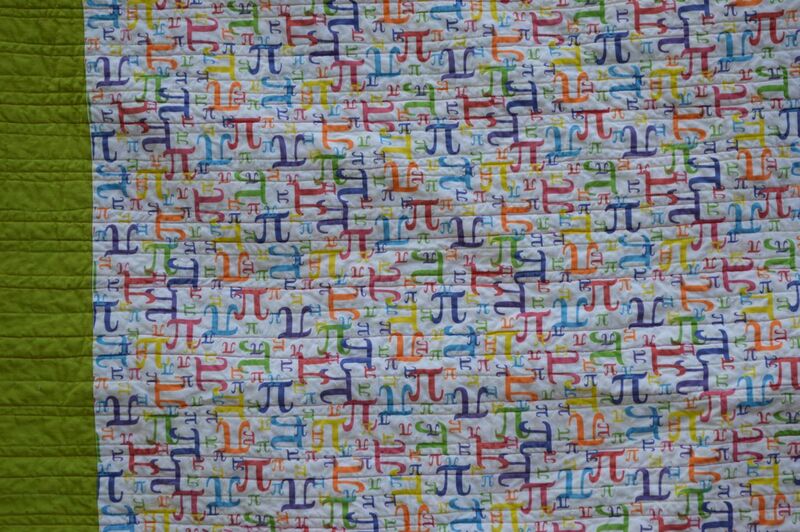 I framed a yard of the Pi fabric with green and a splash of orange. The binding is a teensy bit scrappy, with grey and pink and orange. 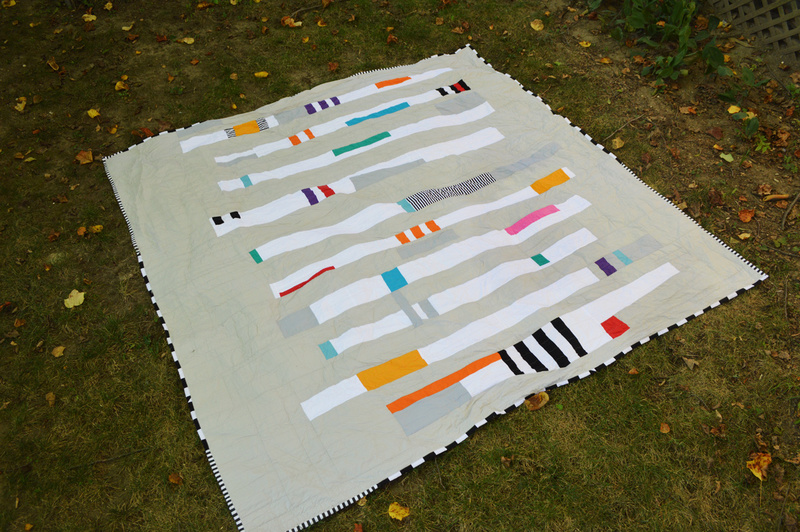 It’s been a long time since I’ve blogged about my Lessons in Modern Art for the Modern Quilter – but I’m back! Today we’re looking at Cubism – hello, Picasso! 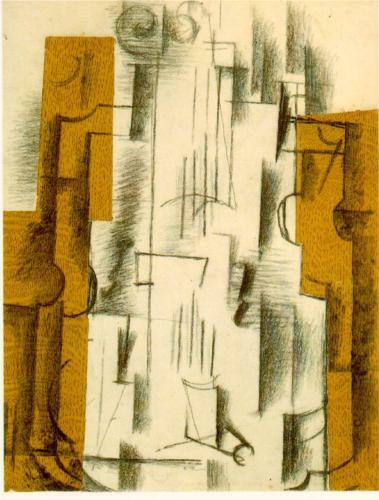 The style of Cubism was popular from 1907 – 1922. Cubist artists worked to depict objects as they really were in the world – not as we perceive them. To better understand this movement, let’s start by considering a glass. A drinking glass has a circular opening. However, when we view the glass from an angle at the side, the opening appears to be oval-shaped. The glass has not changed, but our new position has changed the visual representation of the glass. 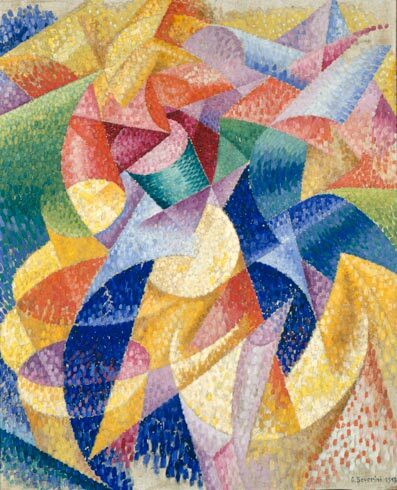 In order to depict a glass as it really is, a cubist painter would break the image of the glass into geometric shapes, and arrange them across a field so that multiple perspectives can be seen at once. 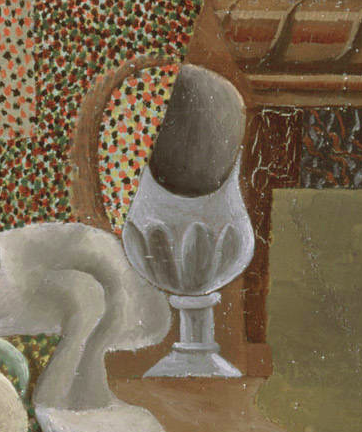 We see a goblet from the side – noticing the height and shape of the glass’s silhouette, but we also see the circular nature of the cup opening due to its flipped and elevated placement above the goblet body. By tossing aside notions of one-perspective and allowing multiple views to exist on the same canvas, we are able to achieve a fuller understanding for the true nature of the glass. This style of multiple viewpoints is sometimes called simultaneity. Another prominent Cubist artist was Georges Braque. I love this piece where he takes the basic shapes of a violin, separates them into individual geometric pieces, and spreads them out so we can fully gather his impression of the instrument. 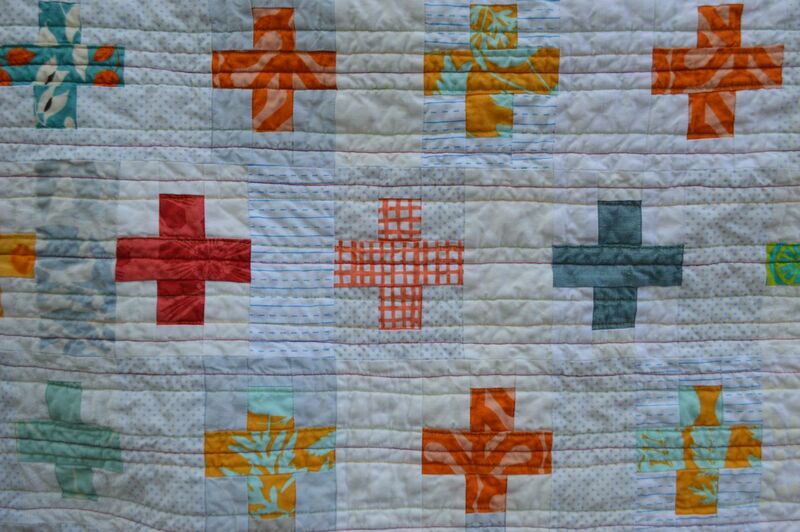 The concept of taking an object and breaking it down into it’s basic geometric shape is very familiar to us quilters! 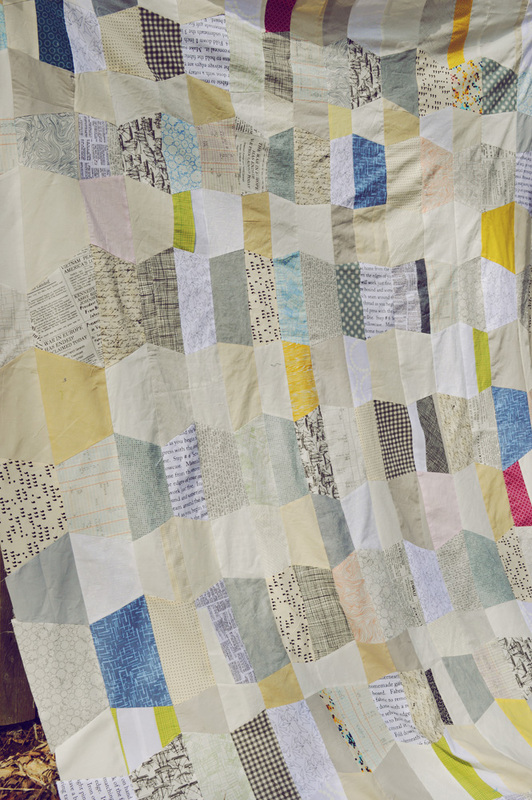 And it should be noted that the cubist movement has been a very prominent source of inspiration for art quilters, who respond to the realism aspect and create a portrait of an object through fabric piecing, applique, and yes- sometimes glue! 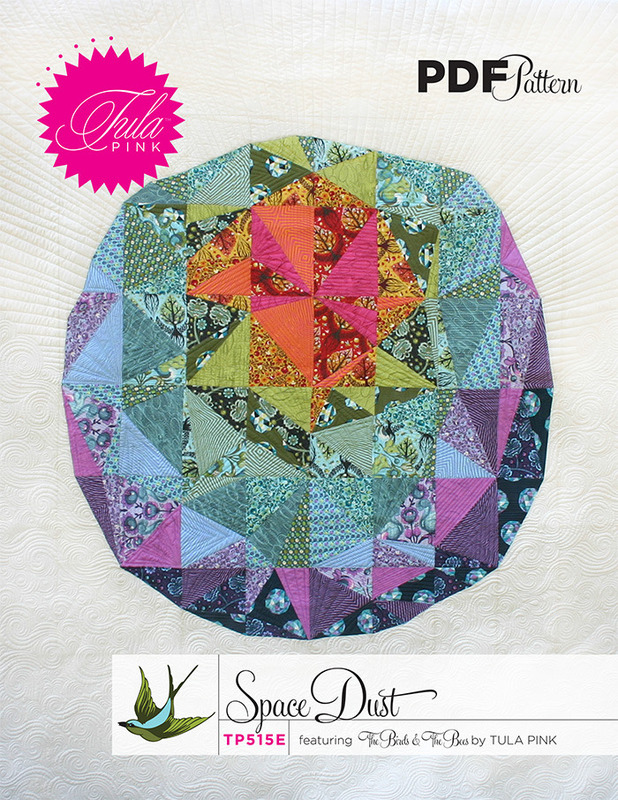 But one modern quilt that comes to mind when I think of Cubism is the popular, intricate, lovely “Space Dust” quilt pattern from Tula Pink. Here we gather the full impression of a cratered moon through the artful arrangement of triangles. 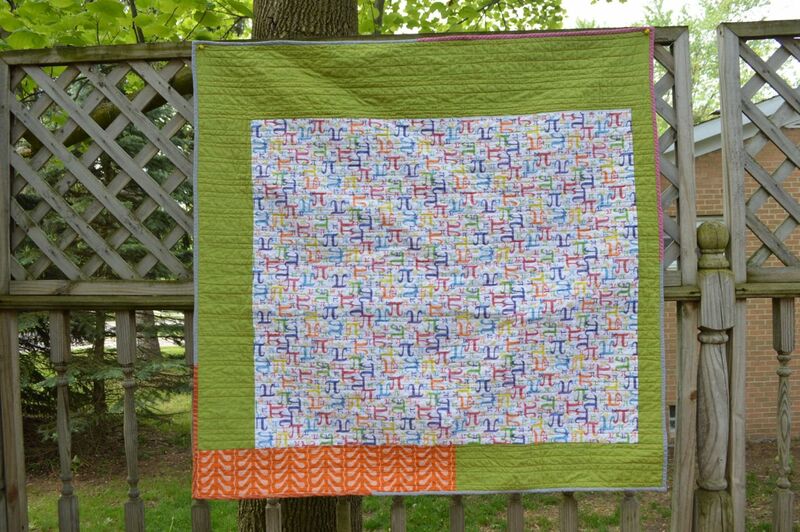 After seeing THIS IMAGE float around pinterest ( “Trapezoid Love” by Melanie Mikecz), I knew I wanted to do a wonky tumbler quilt. And, like the inspiration piece, I wanted my points to match. 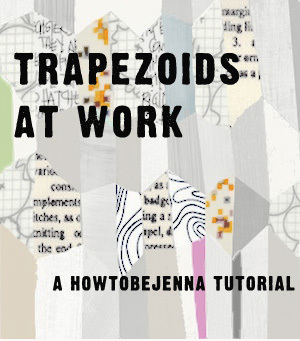 Wow… how was I going to make a liberated trapezoid quilt (no meticulous calculating and template-making), and still get the points to match? 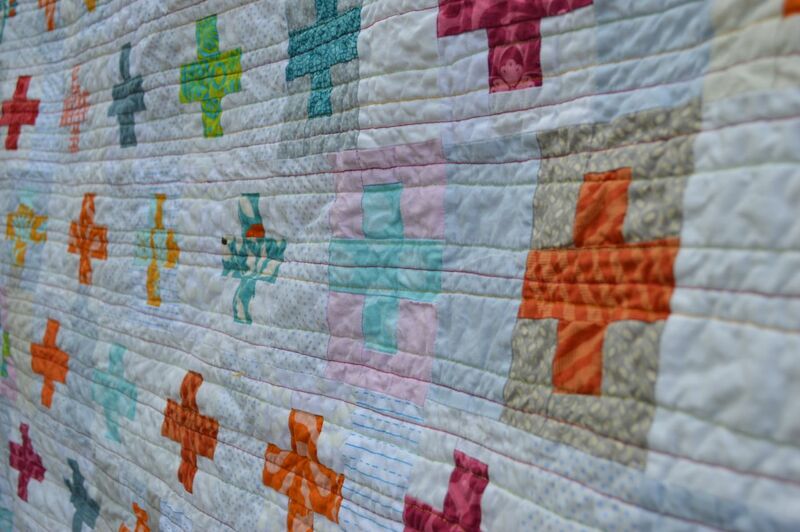 I’ll chat a bit more about this quilt when I finish quilting it and binding it, but for now – a full tutorial! I have no idea if the below will make any sense, but I tried my best and… you know… it’s free for you to read. In today’s Lessons in Modern Art for the Modern Quilter, we’ll examine the Italian tech-savvy artists of their time — the Futurists! From about 1910 – 1920 an unofficial group of Italian artists became fascinated with modern technologies, and the new urban environment. They wanted to make art that truly embraced the hustle-and-bustle of a metropolis. How can flat paintings convey the tremendous motion of a busy city? The new technology of chrono-photography showed these artists one way to show movement within a static frame. Chronophotography was the use of a special camera (one with many lenses – as many as 12) that would take several pictures in rapid succession. 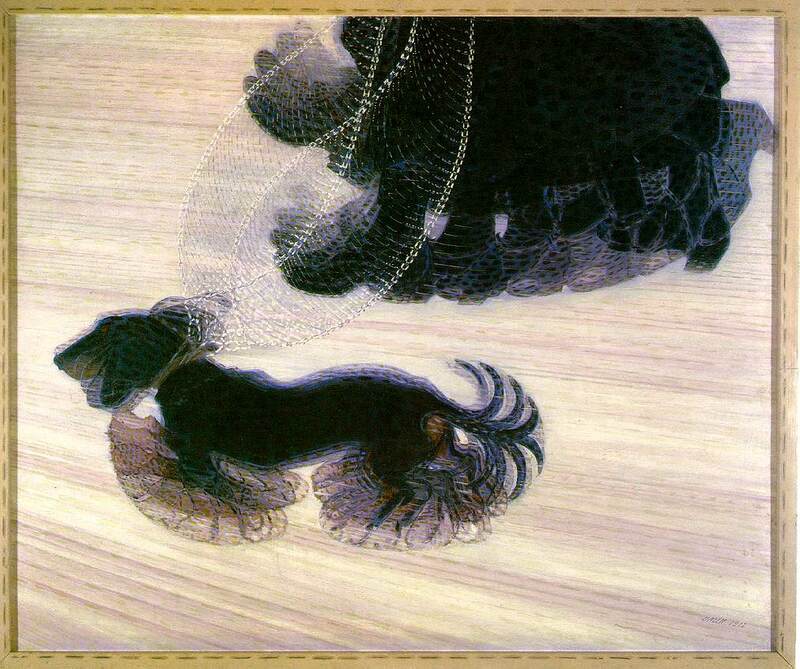 These frames could then be displayed together or even overlapped to convey movement. There were also major developments in the Optical Sciences during this time. Artists interpreted the theories presented in recent scientific developments to mean that colors would get a stronger luminescence if pure, unmixed dots or strokes of pigments were set next to each other. Then the viewer would mix the dot colors together with their eyes, creating a more vivid look to the work. This method of painting is called Divisionism and is a by-product of the Impressionist movement of Pointillism. 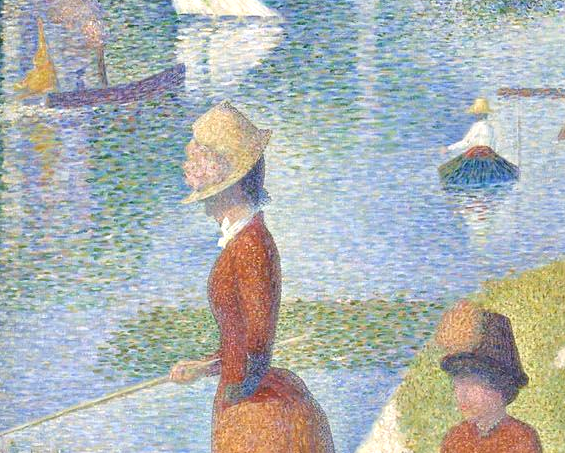 Pointillism was more focused on the paint-stroke style of juxtaposing pigment dots, and was not as concerned about the optical science basis of the separation of colors. Not only does this work showcase the brush style of many small quick, unmixed strokes to create a vivid color representation, but it also is conveys movement and an even 3-D quality. Digital photography has become the norm and with that comes the use of computer photo-editing software. Concerns regarding DPI (dots per inch) or PPI (pixels per inch) have crossed over from the technological world into our sewing designs! Modern Quilters certainly are linked to modern technologies – uploading images to their blogs, joining link-up parties, using every latest mode of social media; we can use the term MODERN to mean of-the-moment and up-to-speed, but it’s also fun to look at the Modern Art style of Futurism and see the comparisons with our modern quilting movement.